Owning a rangefinder, like the Bushnell Bone collector rangefinder, may seem like an unnecessary splurge. But imagine yourself having tracked a deer for close to 500 meters, then one step on a twig and vamoose! The animal goes. It is quite frustrating to start tracking again. You may have even gotten close enough, taken the shot but it only injures the deer, so you are left chasing after a wounded animal. How easy would it get if you used a rangefinder to calculate the distance between you and the target? The main attraction of a rangefinder is that it uses a laser beam that bounces off the target and back to calculate your distance from the target. This way, you don’t need to be that close when taking a shot. It gives you an easy way to pre-focus your shot so that you can always be in range. Rangefinders are easy-to-use, hand-held and mostly present high qualities at a very affordable price. They cost from under $100 to over $500. If you are working on a budget, there’s always a brand that fits your budget. 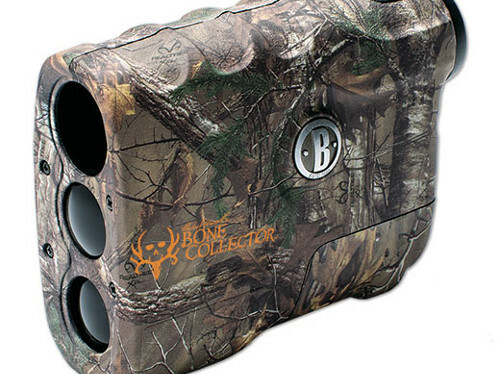 Here, we look at the Bushnell Michael Waddell Bone Collector Rangefinder. 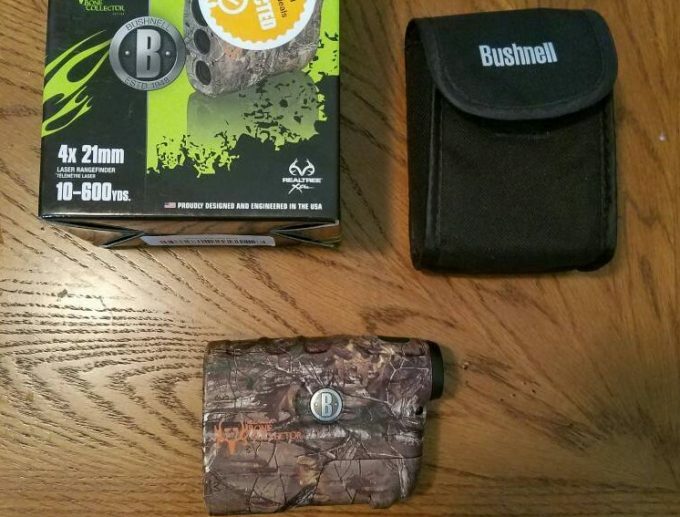 Bushnell is a household name, and this product probably beats most of the features presented by its fancier competitors. For a very attractive price approx. $120 one gains a useful product which meets most needs for most environments. It’s easy to see why rifle hunters love the Bushnell Michel Waddell Bone Collector 4x21mm Edition. It appeals to anyone who likes spending some time in the wild without worry of the terrain or the weather conditions. As you can see it is not a brightly colored rangefinder that is why it grows popular among long range hunters, who want to venture further into the grounds. It is high on precision making it the standard tool if you want to bag the buck that you missed last year. It does not carry a manual on how to use the product. This is because it is quite straightforward and only needs the input of the battery. You will be required to purchase the 9V battery it uses for operation. These are available in nearly all stores so you can buy several for future replacement as they are not rechargeable. You want to depend on your rangefinder in the long term. With the Bushnell Bone Collector, it bears an entirely rugged design to protect it from the extreme, unpredictable scenarios. While hunting is an enjoyable thrill, there are a lot of bumps which your rangefinder comes upon. This make is built to withstand nearly all types of hunting abuse which come from falls and covering rough terrains. The weather resistant housing sees that it seals completely away from rainfall. The exterior Realtree Xtra camo design may not exactly appeal to golfers and photographers. This is because it targets the need for one to blend with their environment. It is of utmost importance that one masks their position, especially in close range hunting.With it, it does not glare when hit by the sun’s rays. The finish also keeps it away from corrosion and abrasions as you’ll have it for a long time. You’ll be surprised by the compact design which means you can tuck it in your pocket or hang it around your neck since it is very lightweight. The weight tips the scale at around 8 ounces does not compromise on its sturdiness since you’ll find it’s very robust for its size.It has a tethering option to input the cord that you’ll be using for easy access. 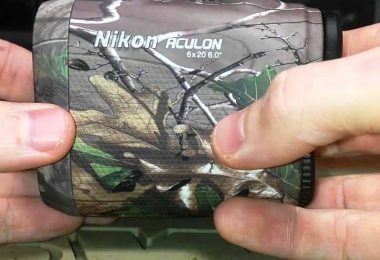 Its vertical style is a perfect fit for one hand operation, making it one of the most comfortable range finders to use. Also, you’ll find that the one- button function makes it simpler to input commands. This makes it easier for you to toggle between the meter and yard options when you want to use either. The location of the power button lies conveniently under where the index finger should be.This way, any change you want to make becomes quicker and simpler. With such a straightforward method of operations, it’s no wonder anyone can perfect their ranging skills using it. The Bushnell Bone Collector rangefinder uses a 9V battery, as mentioned above. This type of battery is easier to find, and you can reuse it for as many times as you’d like since it also conserves energy. Say you use it for three times a week; you are bound to use it for around six months.You may also want to leave the battery out of the rangefinder when it’s not hunting season. This will prevent any leakage which would otherwise destroy other parts of the rangefinder. The battery compartment affords a tight fit to the battery such that it stays intact even when the range finder is subjected to high impact. It is always good to carry an extra battery in case it goes flat or accidently bumps into something it cannot handle.The cover can come ajar during a hard fall, making you lose your current battery. The spare battery will come in handy then. 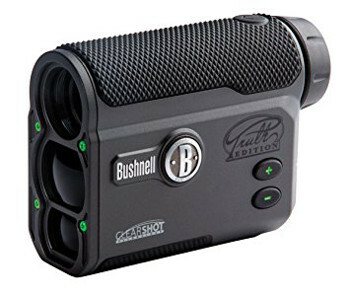 Bushnell Michael Waddell, Bone Collector Edition is a laser beam rangefinder which gives accurate readings for up to 600 yards. It boasts an accuracy of +/-1 which is an important aspect when ranging in long distance hunting.It bears a very precise clock which gives perfect distance readings on soft targets, that is deer, whitetails, bucks, etc. On hard targets, say against rocks, it is a bit more difficult because it does not have the allowance for angle compensation. It’s impressive that you get 100% correct readings up to a distance of 200 meters on soft targets. It means anything the size of a deer can be correctly ranged and close shots are possible with quick precision.When targeting over very far distances, you may be required to calculate the distance to aim for. This happens when stalking moving targets with this range finder; because it does not have angle compensation properties. It carries superior optics; a crystal-clear design on the lenses allow for maximum light transmission. The lenses offer a very sharp focus that is not only bright but also helps one to acquire the target against any background. The 4x magnification power is a paramount aspect that assists in better ranging. This is because it provides a super wide field of view that gives a larger image, much better than you could with your naked eye. It also allows one to use both eyes when focusing since it has been compensated for parallax, as such, it functions quite well for middle-long range hunting. 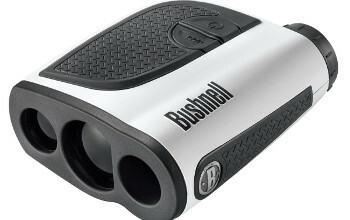 The Bushnell laser rangefinder carries an objective lens which measures only 21 mm. This lens contributes immensely to the lightweight experienced. It helps with the automatic focusing which is reliable in giving precise readings so that you can make a clean shot.The range is displayed on a bright LCD which is visible up to total darkness. It indicates the measurement on the targeting reticle and also the battery level. However, there isn’t a way to adjust the brightness settings, such that during a very bright day the readings may appear unreadable. This is where such readability comes to save the day, as you can see clearly in low lit environments, like in the midst of thickets. From a product which has an extended life, waterproof capacity uses less battery and is a compact size, you get it at a decent price of approximately $120. Bushnell does not overlook the qualities when dishing out their rangefinder. The manufacturer, offers 100% money back guarantee, on their bullet proof one year warranty. They also offer repairs that directly affect the performance of the rangefinder. 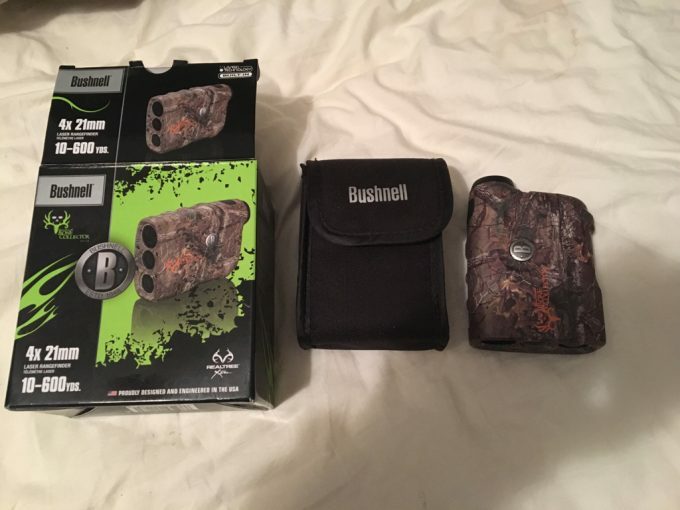 They don’t however, provide replacement and repair to any effects which may be due to prior repairs by other technicians not supported by Bushnell. The good thing is that they offer a printable repair form for fast processing for both USA and Canadian users. The aspects above present a rangefinder totally meant to brace the outdoors hunting experience. It camouflages with the environment and is super lightweight. The accuracy is unbeatable so you can be pretty sure it is reliable. 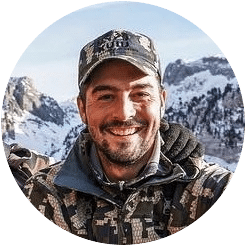 Bow hunters now start to gravitate towards it for its accuracy and clarity that beats most rangefinders targeting bow hunting. 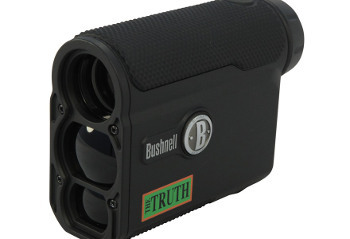 Like the other model above, Bushnell ARC 4x20mm The Truth carries attractive features. This one has HD clarity on its optics, which offers bright viewing of the images. It is also rain proofed and has an elegant design which comes with an anti-slip surface. It is pocket sized and robust so it can withstand the outside extremes. The Bushnell The Truth Bowhunting laser rangefinder comes with a carrying case, a neck strap, and the battery. This model ranges out from 7-850 yards which work best with reflective targets. It is imperative to know that unlike the Bushnell Michael Waddell, this one allows for angle compensation at -90 to +90 degrees. It is arguably better for it uses the Clear Shot Technology which gives the true horizontal distance of a target from 7-199 yards and instant feedback on shot clearance. It may seem better, but it is hard to use when alternated for rifles. This is because it comes specifically recommended for bow hunting. The clear shot is what attracts most users as the ideas of hunting in steep surroundings need more accuracy when acquiring the target. It is even more impressive because it comes with 100% Money Back Guarantee and allowance for repairs and maintenance. The price is also budget-friendly at around $180. However, it involves a bit of a process when calibrating the rangefinder to the bow sight in use. This also requires one to recalibrate the rangefinder every time one changes the arrows or bow. With a range focus of up to 1000 yards, this model has a primary focus on golfers. The Bushnell Medalist Rangefinder uses the Pinseeker Rangefinder technology for quick pin acquisition. It gives instant, accurate information on 250+ yards to a flag. The Pinseeker mode correctly zeroes in on the flag to enable the golfer to take accurate strokes. It bears a high-speed clock and high-performance circuitry which gives instant calculations of the distance. With an accuracy level of +/-1 meter, one is always sure of being on range. Most users like this aspect as they can rely on it to be always within the yardage. Also, since it can be held like a pair of binoculars, it has grown popular among users who have shaky hands. It also features a scan to afford multiple ranges when panning (i.e. when swiveling the rangefinder from a fixed position). It generates Infrared, invisible, eye safe pulses (Class 1 laser), which carries out the bounce off the target. The pulses allow for precise target selection back to the optics. No one needs to make almost strikes; instead, the specific selection provides golfers an easy time at every stroke. The digital functions are easily monitored since it gives indications for low battery level and it also comes with the 9V battery it is powered. Like the other models above, it is also weatherproofed with a durable casing that is sealed against water entry and other types of contamination. Its magnification is also 4x meaning it does not differ in its field of view features. Even with all the unique properties, it comes in a bright color making it suitable for only golfing. 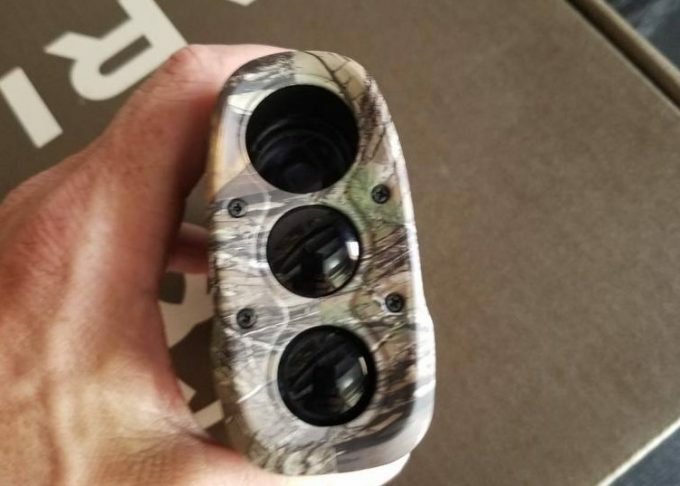 The surface may provide glare, and as such, it competes on parallel grounds with the Bushnell Michael Waddell Bone Collector. Their paths may never cross as they are clearly purposed to cover different fields. Coming in at approx. 200 dollars you’ll find it useful if you are an everyday golfer or are just a newbie. 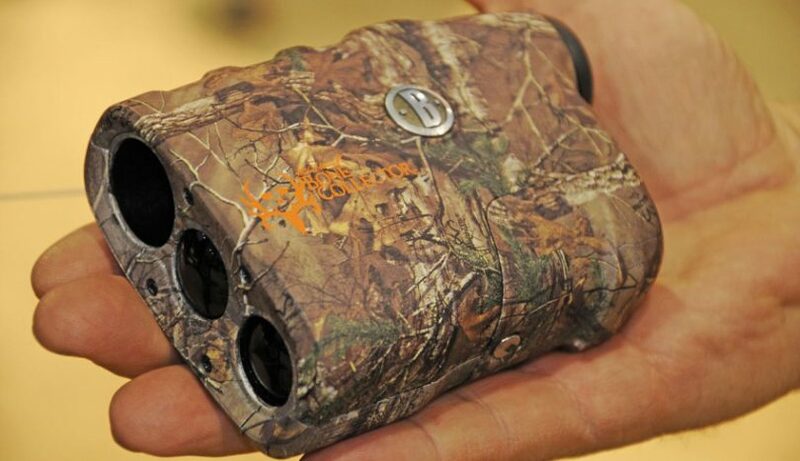 This pocket-sized Bushnell The Truth Primos ARC Laser Rangefinder has a 4×200 feature on the reticle. This gives the hunter a bright image, sharp focus and a full field of view. It allows for Angle Range Compensation (ARC) which is a great feature because it displays everything between the highest point of aim and the target. This way the hunter can tell obstructions that lie between their shot and the target. The long ranging from 4-850 yards means that one doesn’t need to be physically there, to get close to their target. A unique feature of this model is that it carries a built-in digital inclinometer. It comes in handy when hunting in terrain with high and low slopes. It measures angles from -90 to +90 degrees at an accuracy level of +/- 1 meter. It also gives a true horizontal distance from 7-199 yards. These characteristics make it suitable for middle-to-long range hunting with a bow and arrow. It is, therefore, suitable for unpredictable scenarios where one can make quick and fast target acquisitions. The pricing is quite a steal at approx. 200 dollars. Users particularly love it because it is budget friendly. However, some show that tracking fast moving animals may present some challenges. Bushnell has not neglected any aspect as this model. It is also waterproofed in a sealed casing. It also has a lightweight design; 5.9 ounces that come with a non-glossy finish. The anti-slip surface is a sure grip feature where no matter the weather conditions; one can still make quick adjustments even when you have gloves. It comes with a neck strap and a 3V battery. There’s also a battery life indicator, meaning you’ll never have the chance of a flat battery as you can see the battery level. 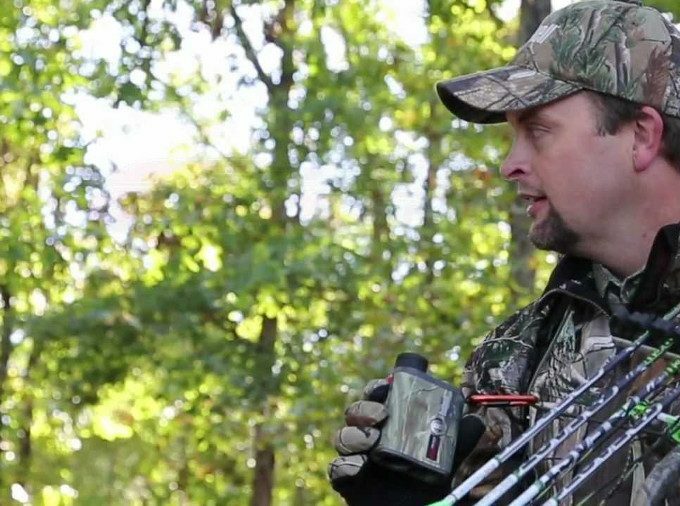 When compared to the Bushnell Michael Waddell Bone Collector Rangefinder, the two have incomparable features as they drive the need for different uses. Bushnell Team Primos is mostly suitable for birding, star gazing, nature study and bow hunting. This model has a focus on hunting with the use of a rifle. It ranges out to 600 yards for reflective targets. The real ranging for soft targets stands at 200 yards, which is basically the range required by long range hunters. With an accuracy level of +/-1 yard, it is true to say that it has high-performance features. The operation has been shown as quite easy, using a hold and press the only button, usually located at the index finger. It can, therefore, be accessed easy and with the addition of a cord holder, one can strap it across their body. The general impression is that it is pocket-sized and lightweight to fit the hunting environment where one needs speed when tracking. The display brings forth crystal clear optics and a bright LCD. It is readable in low light to serve hunters who venture at dawn or further after dusk. Being powered by a 9V battery, one can use it for an extended period than regular rangefinders which use rechargeable batteries that can run out in the field. 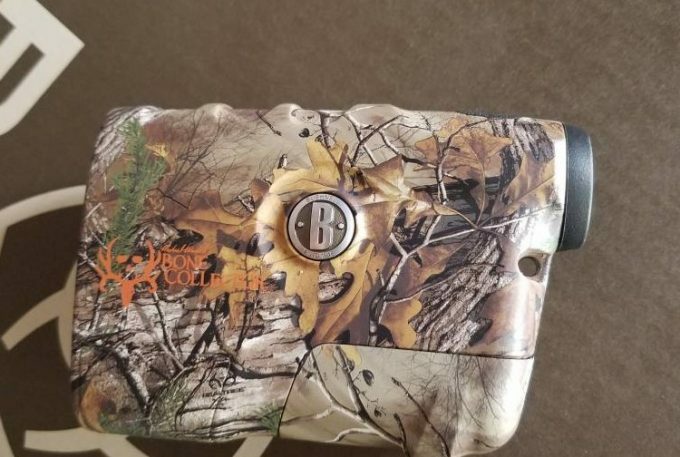 The weather resistant housing makes it possible for one to hunt in various environments and it gives a choice between using the case or stashing it in your pocket when not in use. The exterior design features a Realtree Xtra Camo style. The manufacturer knows the erratic hunting environment which is why they offer a way for the hunter to camouflage with their surroundings. It can thus be used in when hunting dangerous game where one needs to be far enough yet in range to go for the kill. It is apparent that the exact distance measurement is essential in acquiring the estimate for close range shooting when facing off targets in emergency situations. For the price, we can say it is a decent rangefinder. Although the Bushnell Michael Waddell lacks some of the features exhibited by upscale range finders, it is quite reliable. 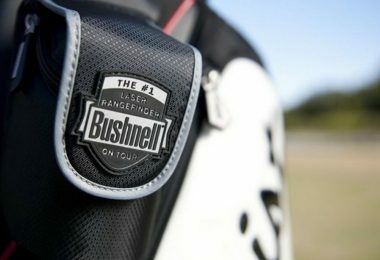 The manufacturer Bushnell is a renowned brand and users have come to associate with high-quality, high-performance products. Whatever feature this product lacks it compensates deeply in its design and accuracy levels. It is definitely worth investing. In a nutshell, you can tell that this rangefinder is most suitable for active hunting between midrange and long range shooting. Since it does not have angle compensation one learns to do such estimations on their own which prepares you for unexpected moments. You will have an idea even in the dark because you can pre-focus your targets. It is with this rangefinder that we conclude it is an excellent find for both new and seasoned hunters. Do you have experience with this rangefinder? If so we’d love to hear your thoughts on it in the comment section below.